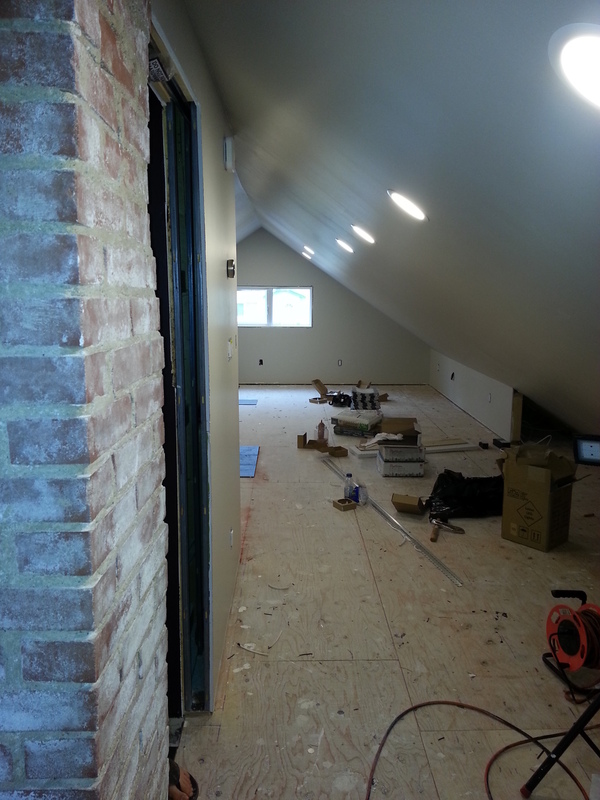 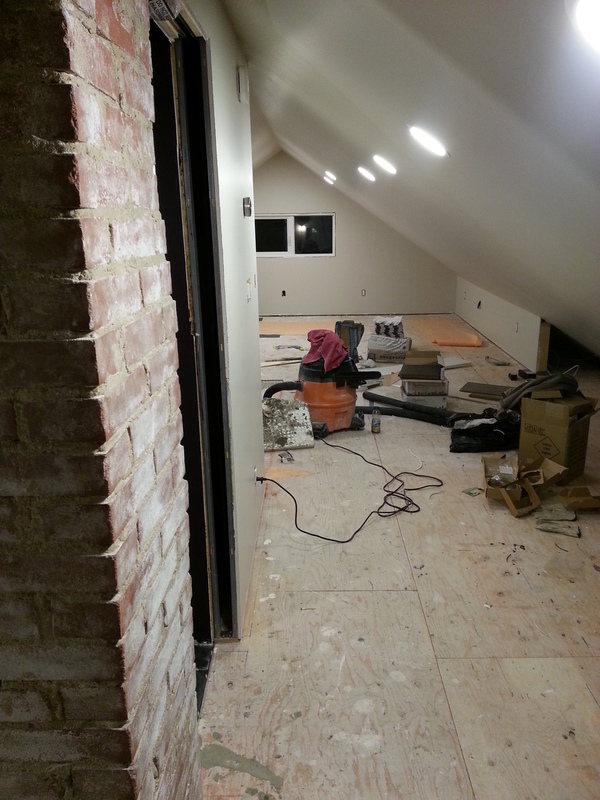 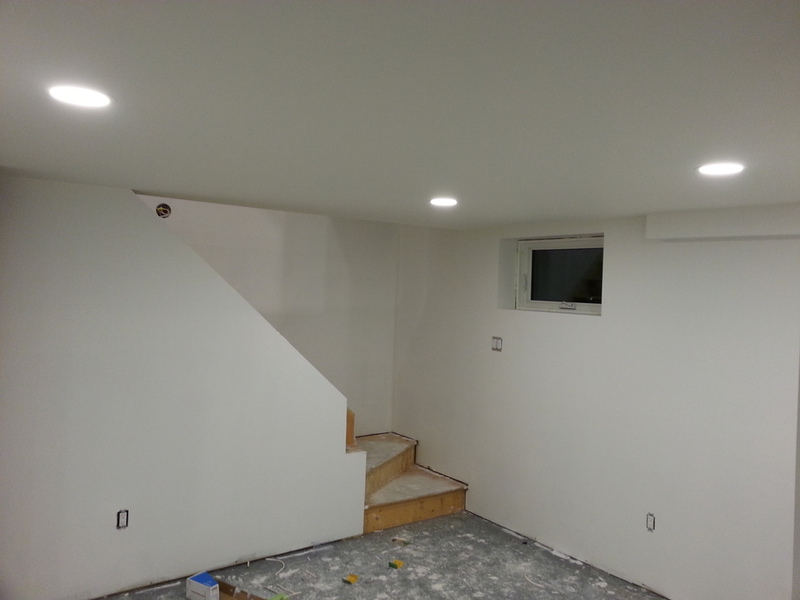 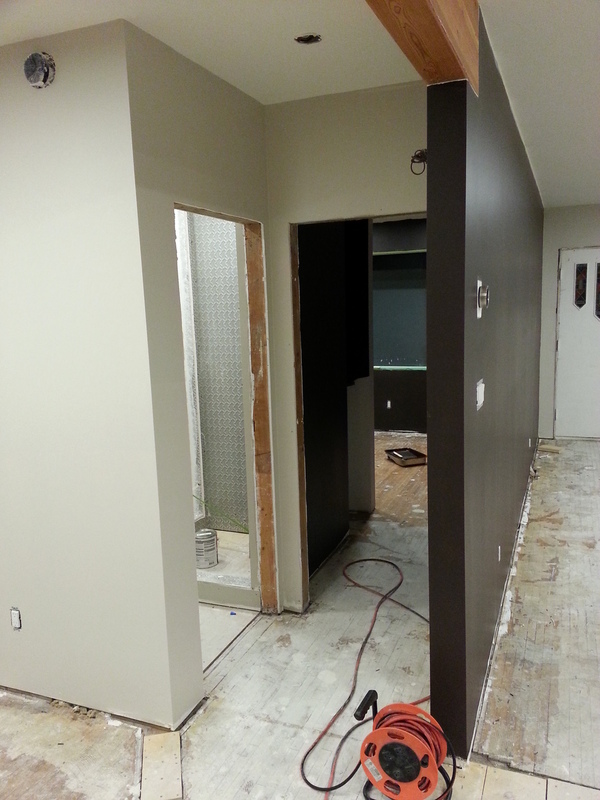 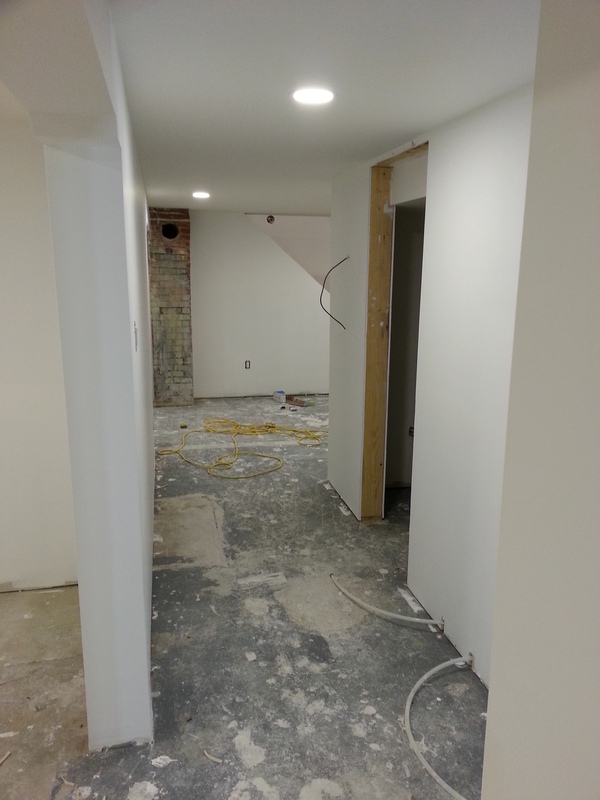 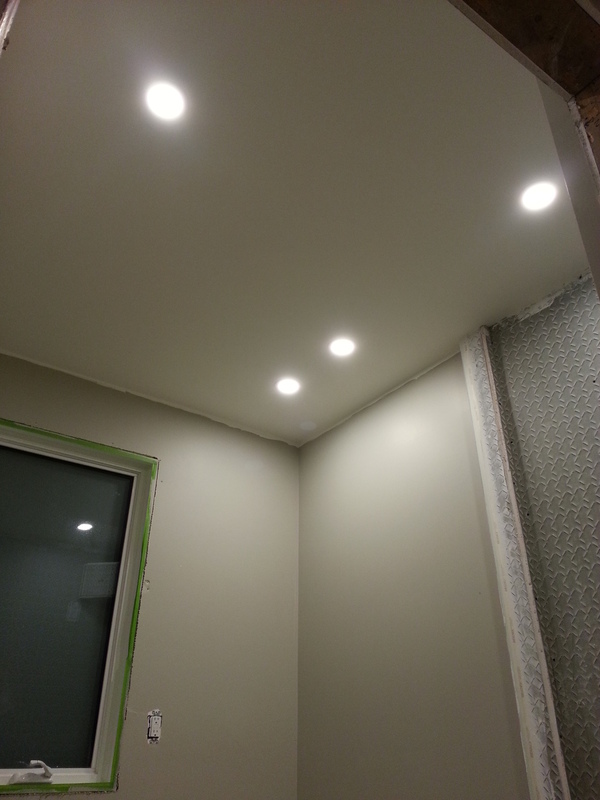 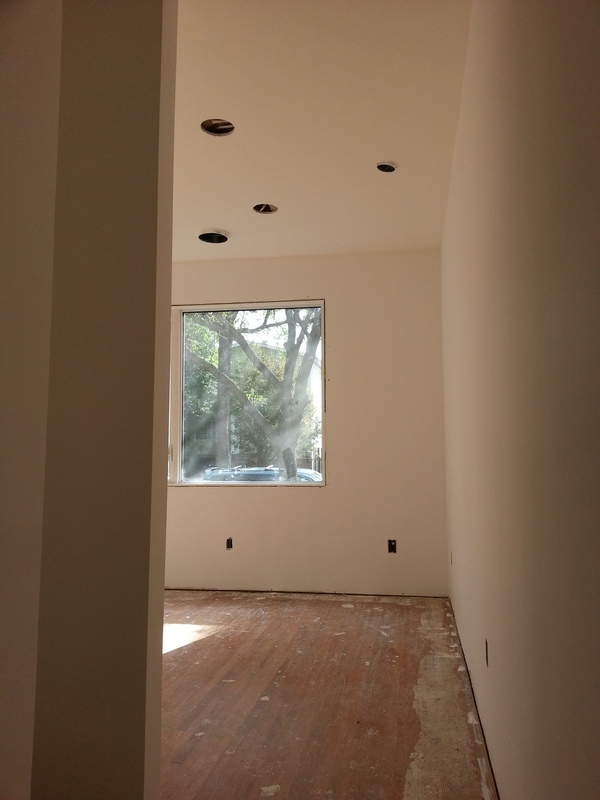 WIR-35-PaintLights — ReNü Engineering Inc.
Chisholm did a great job on the drywall, time to paint. 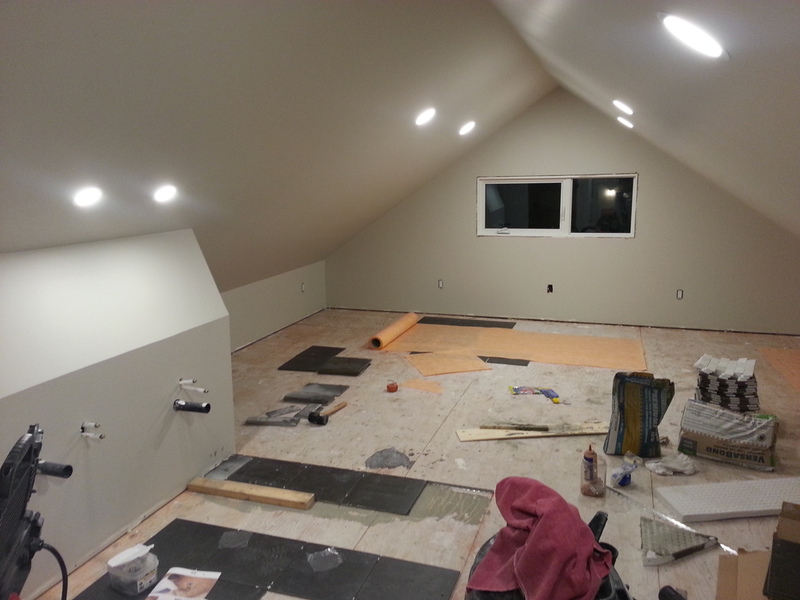 Decided to go with ZERO VOC Cloverdale paint, being of great quality and local supply. 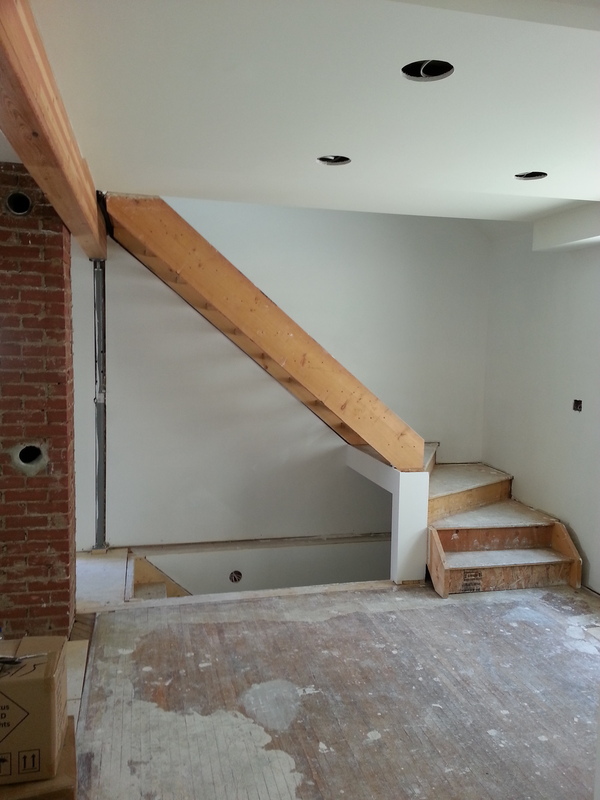 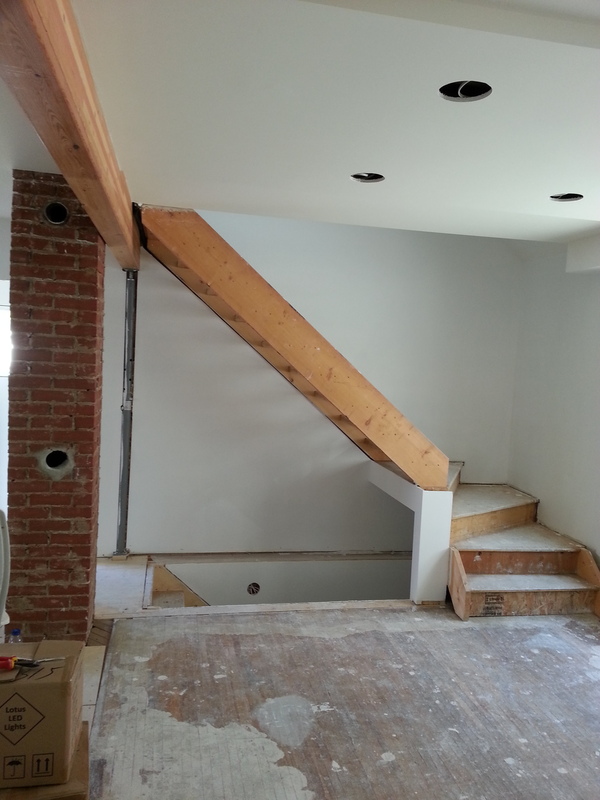 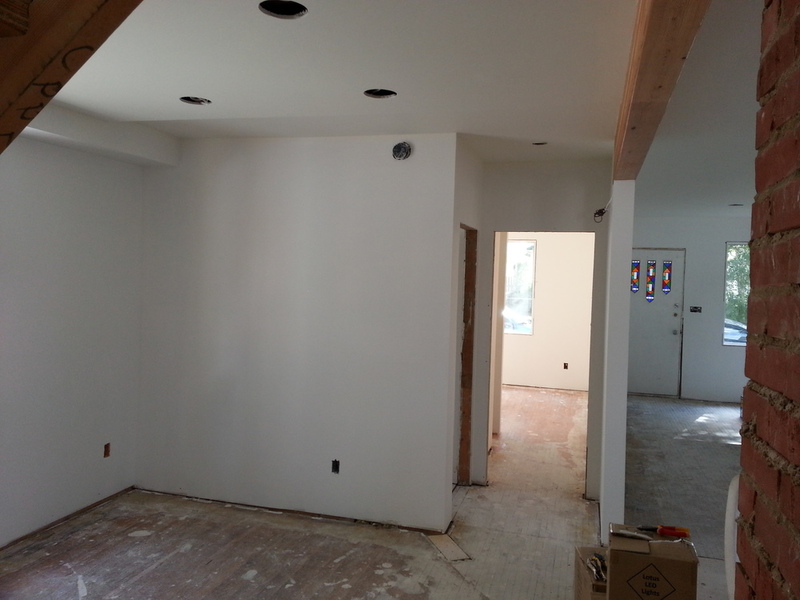 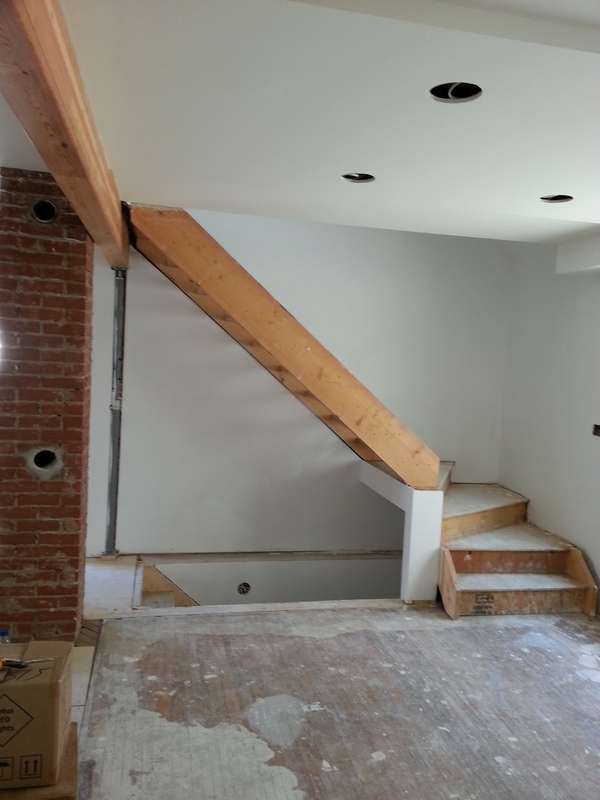 We started by priming the whole house with their drywall sealer. 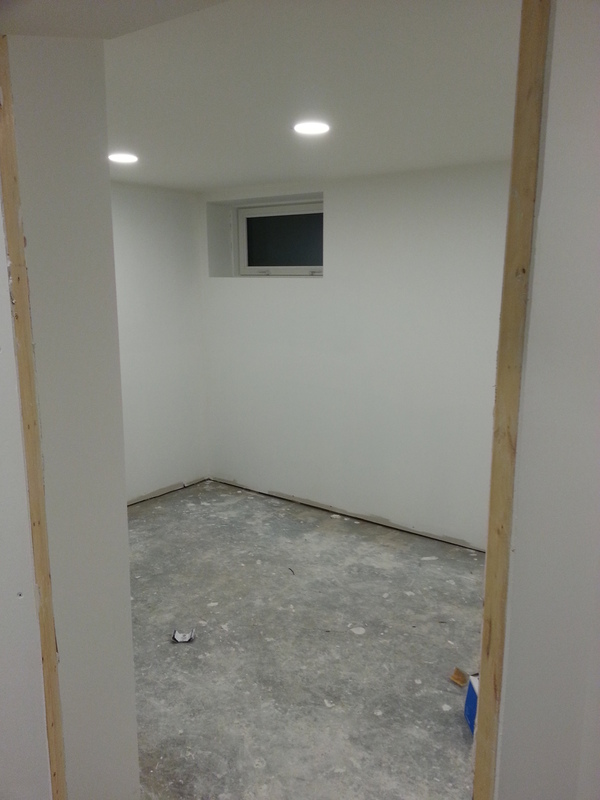 Without plugs or light fixtures to move around, it went quickly. 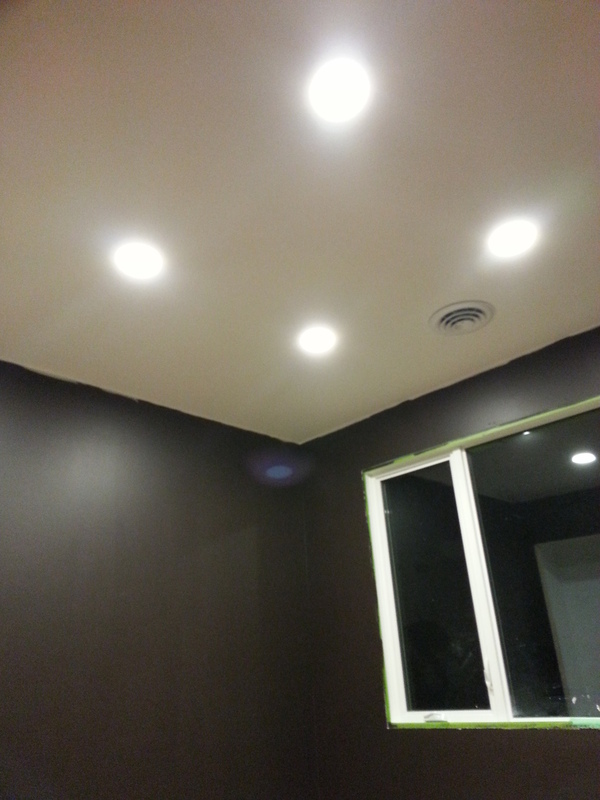 We picked a ceiling color to match the Ikea cabinets, and did two coats on the main & basement. 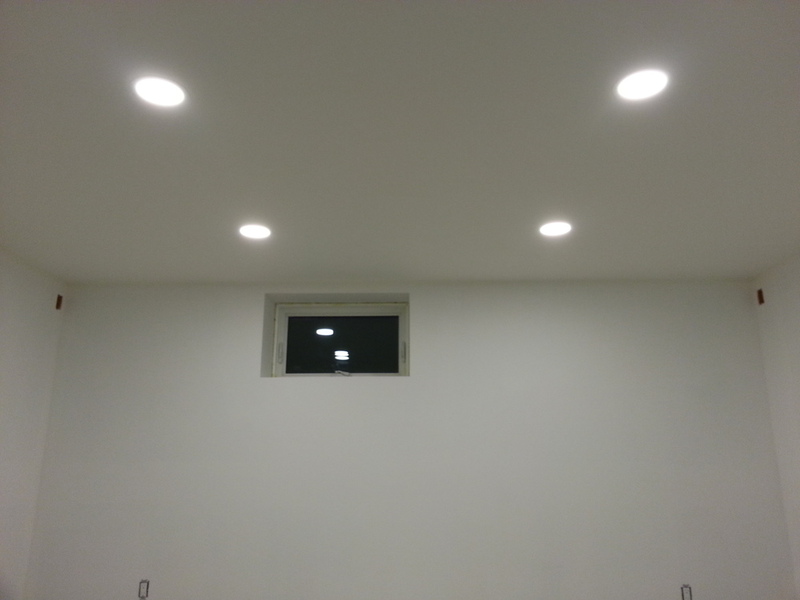 Pot Light installation followed. 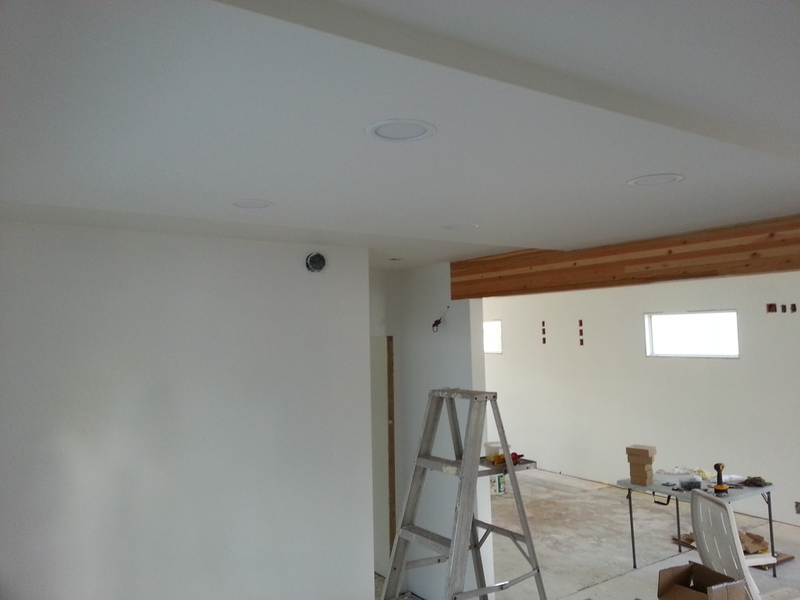 The lighting scheme for the whole house uses a brilliant new LED plate technology. 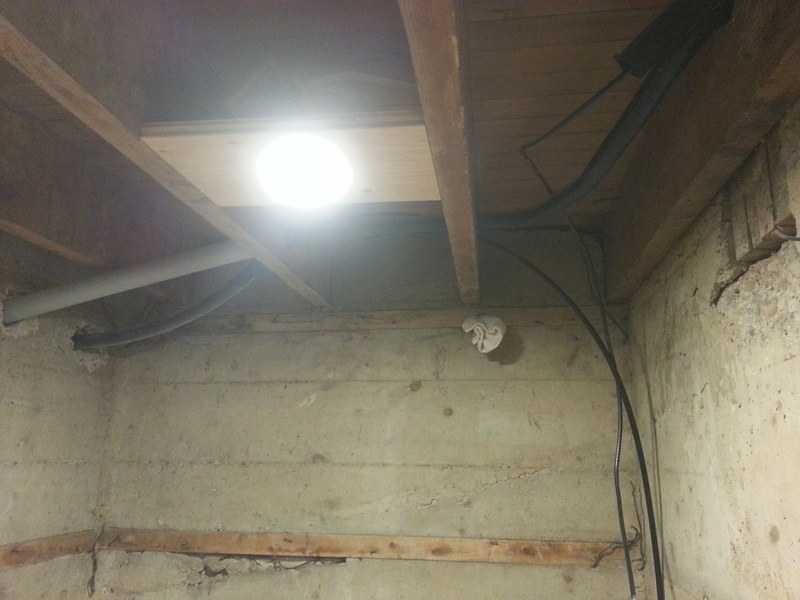 The lights are about 1/2" thick, and consist of a ring of LED's pointed inward and down, covered by a face screen. 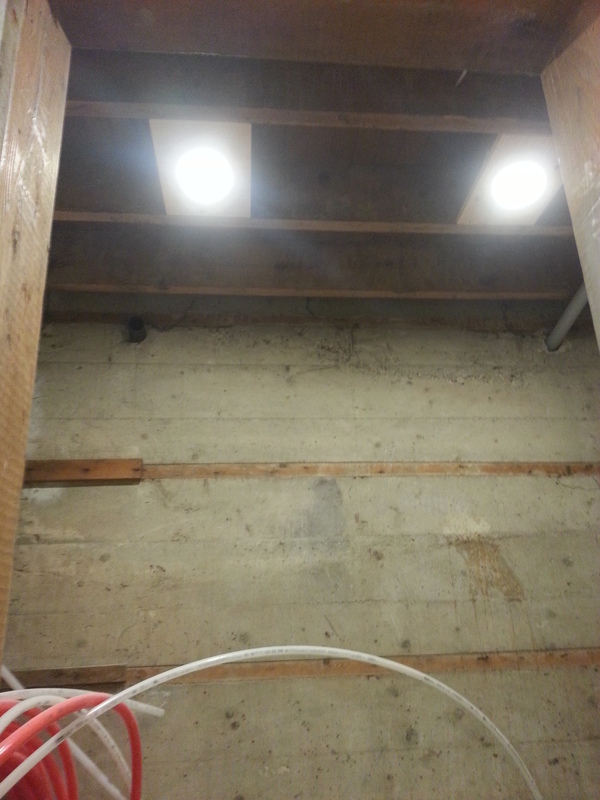 The result is a wonderfully bright, non-directional, light supply that looks quite conventional. 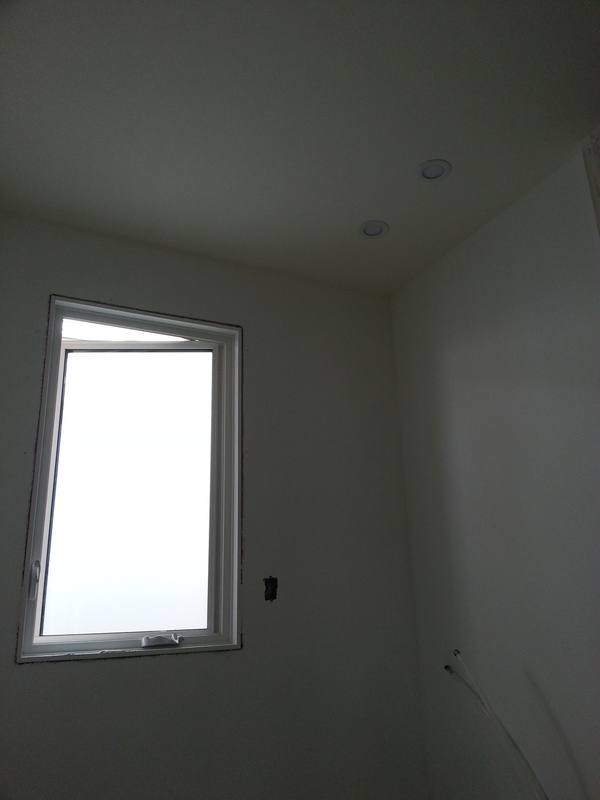 There is a cool 4500K and a warm 3000K option; we picked the warm, and used both 6" and 4" rounds. 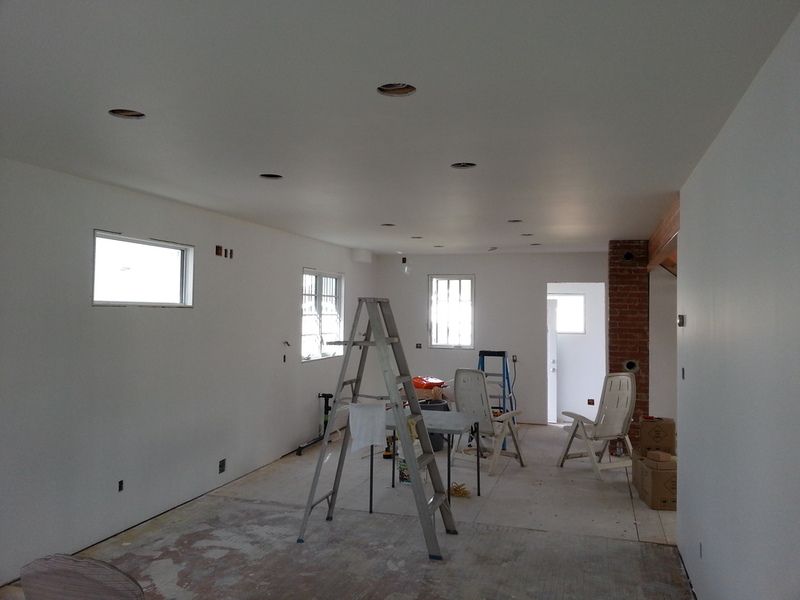 They do also come in square shape, in many sizes. 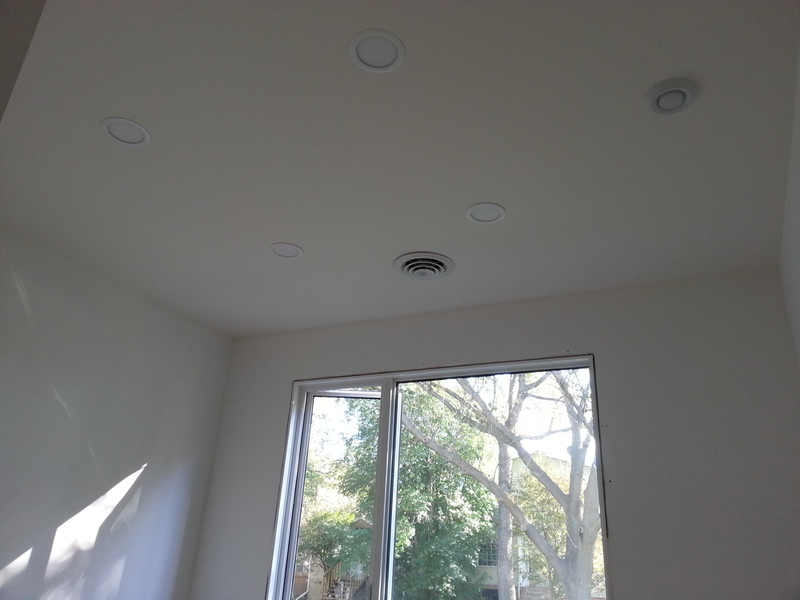 This technology, available from LED Lights Canada (tell Harvey we referred you), fit some pretty restrictive criteria. 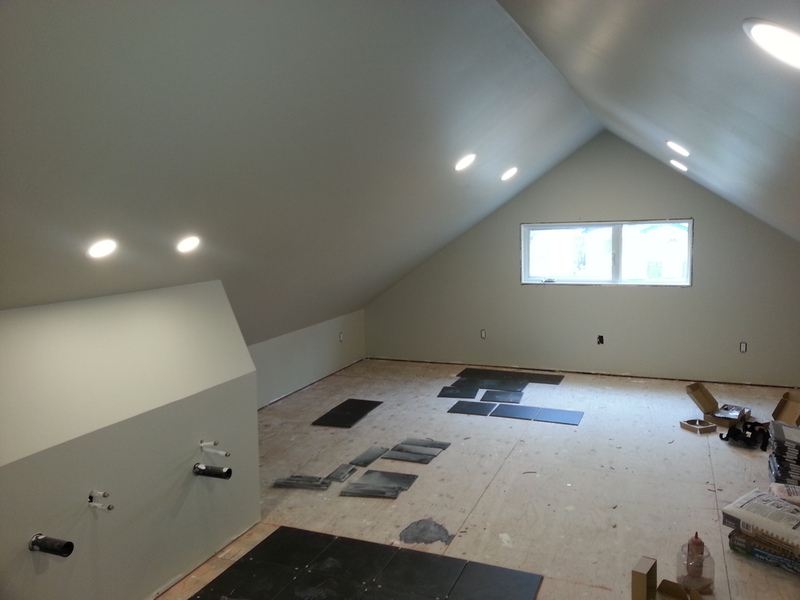 We needed warm, highly efficient, dimmable, economical, and available lights, that could be installed next to insulation within a 3.5" rafter depth. 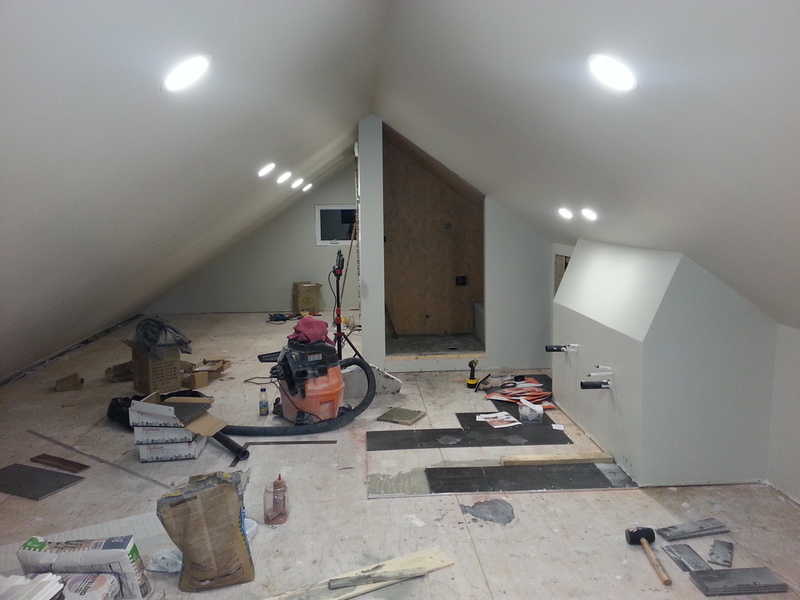 We designed the layout with symmetry and 15 lumen/ft2 intensity in mind. 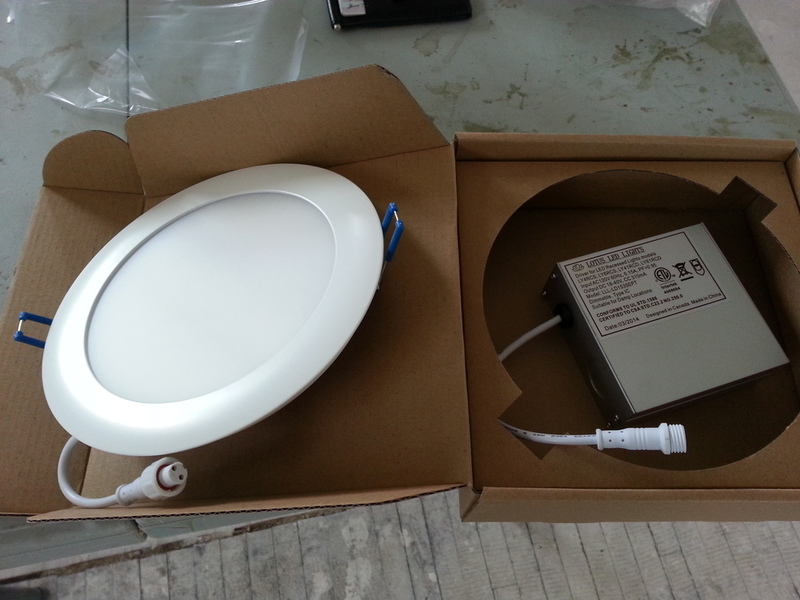 15 lumen/ft2 is near a commercial level of lighting, but since these LEDs are fully dimmable (without buzz or efficiency drop) we can set the level as desired. 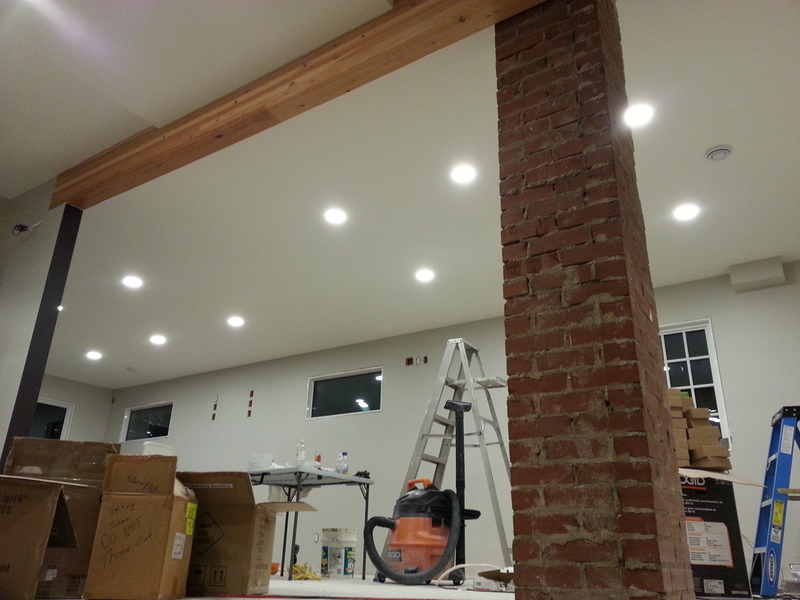 The 6" lights draw 11W peak.. so the whole living/kitchen/dining room area is massively lit for only 176W. 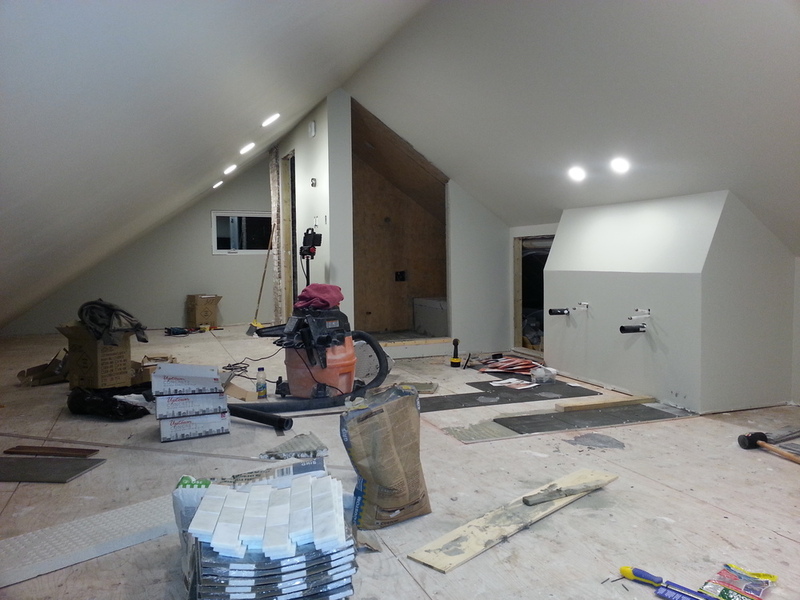 Bingo, the result is amazing! 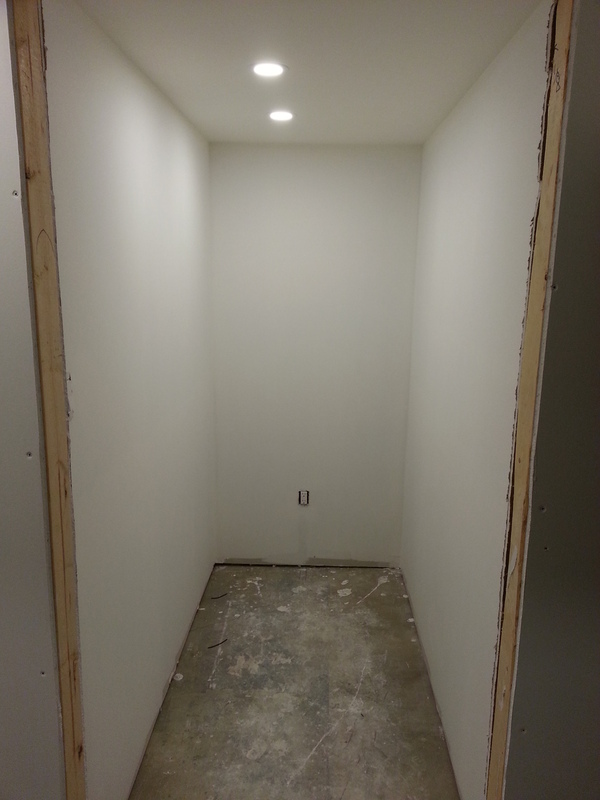 Each light comes with its own transformer box, that's rated to be tossed up into a ceiling space. 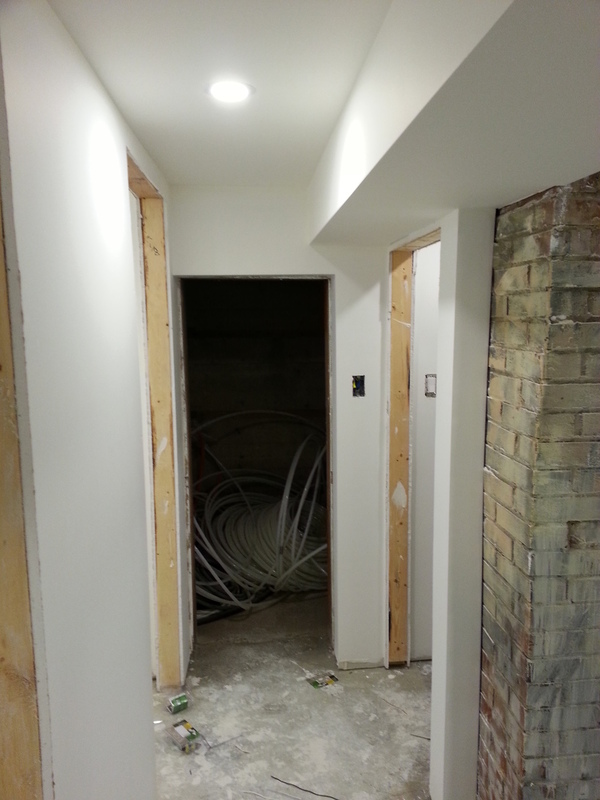 To prep for the lights, you just leave a coil of wire at each location, and wire a room in series off the switch leg. 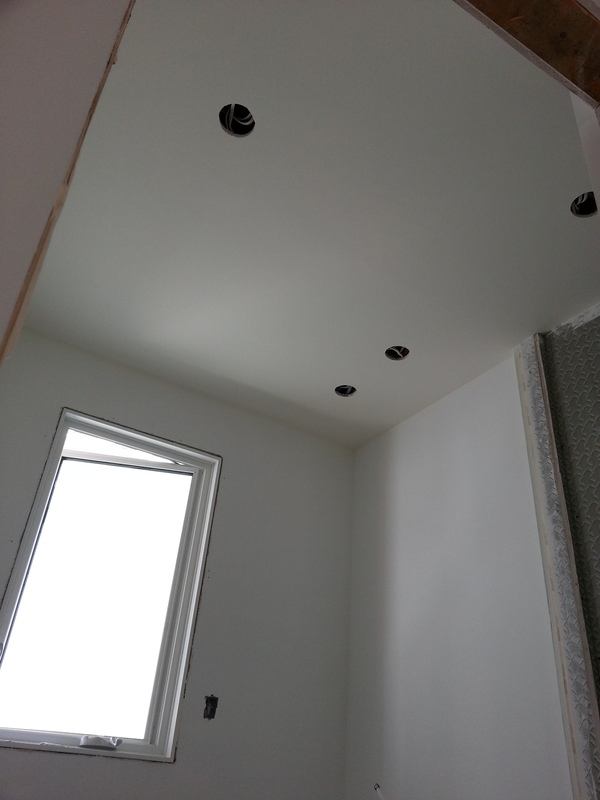 There are thin metal rough-in plates (that we didn't use) which allow for easier drywall hole cutting. 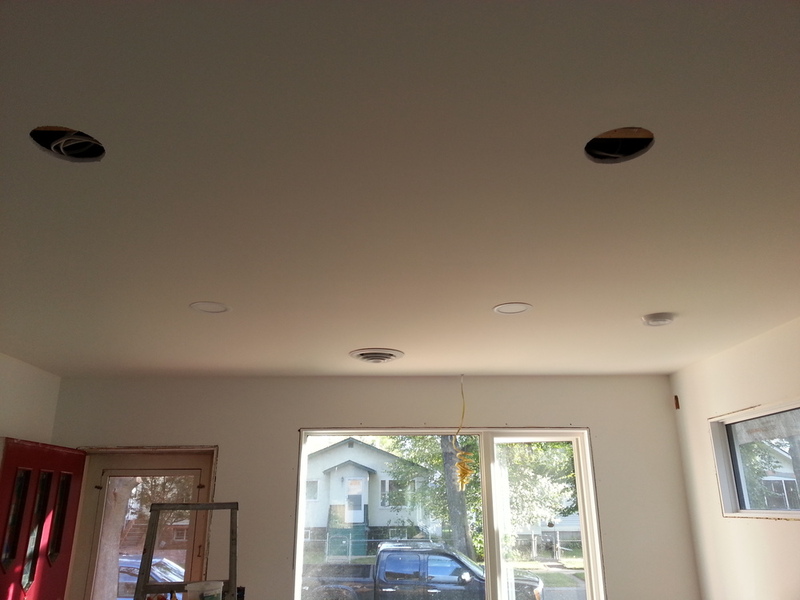 If I did it again, I'd use them, as they also reinforce the drywall hole, if you need to remove/replace lights. 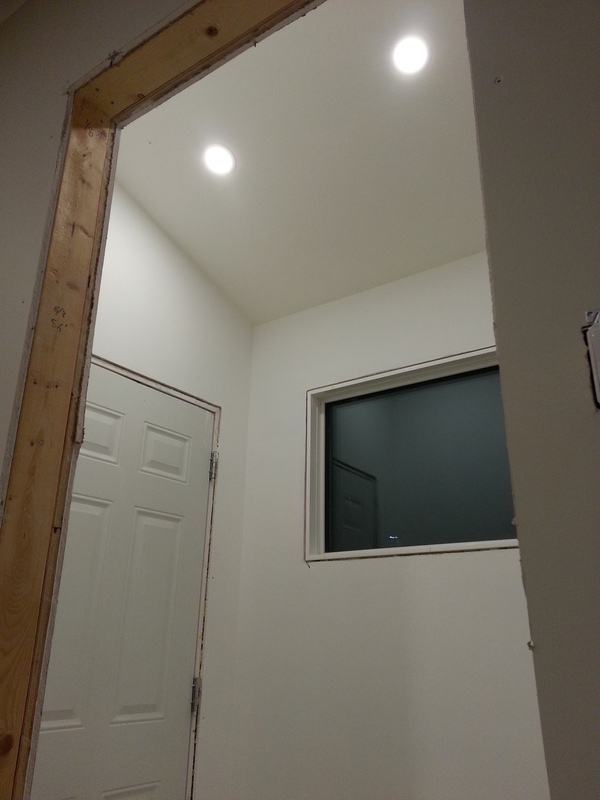 The lights just clip into the drywall hole, so easy! 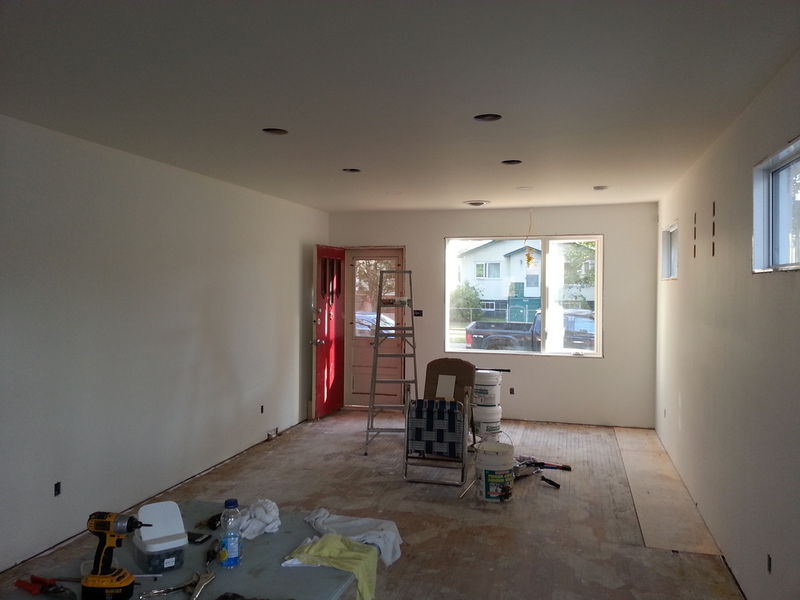 Next we'll continuing painting the walls (using Cloverdale's Horizon Zero VOC line), wire the rest of the electrical panel, and install the kitchen cabinets.